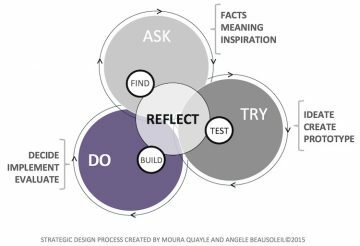 UBC’s very own design process, referred to as the Strategic Design Method (SDM) engages learners and participants in productive consultation, problem finding and problem solving. SDM is concerned with the articulation and integration of both internally-oriented individual and organizational practices (communication and knowledge production) and externally-oriented practices (societal value, market needs recognition and competitive positioning). SDM is designed, taught and practiced at UBC’s Sauder School of Business and Liu Institute. It offers a suite of design techniques and tools that constantly undergo adjustments and revisions to meet real-world client objectives. It is a structure that not only supports thinking and doing, but what to think about and how to “do” or act. SDM is about problem identification (asking why), problem setting (trying and testing) and problem solving (doing and evaluating). Its role is primarily to open and explore new issues before trying to understand how to solve them, using only available resources (Quayle, 2014). Described as a studio-learning method, the SDM at UBC was originally conceived by landscape architect and professor Moura Quayle and evolved in collaboration with PhD candidate Angèle Beausoleil. The IDEO Human-Centred Design (HCD) toolkit is a process and a set of techniques used to create new solutions for the world. Solutions include products, services, environments, organizations, and modes of interaction. The reason this process is called “human-centered” is because it starts off with the people IDEO are designing for. It was originally created specifically for non-governmental organizations and social enterprises that work with impoverished communities in Africa, Asia, and Latin America. The HCD process encompasses three phases: Hear, Create, and Do. 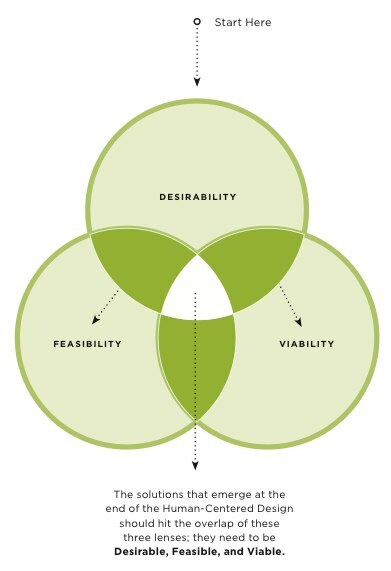 To begin the process, there are three HCD lenses: Desirability, Feasibility, and Viability. First, a range of what is Desirable needs to be identified. Examine the needs, dreams and behaviours of the people you want to affect with your solutions. Seek to listen and understand what they want. What do people desire? Next, each solution needs to be viewed through the lenses of Feasibility and Viability. What is technically and organizationally feasible? What can be financially viable? These lenses are then carefully brought in during the later phases of the process. The Double Diamond diagram was developed at the Design Council (UK) in 2005 as a simple graphical way of describing the design process. 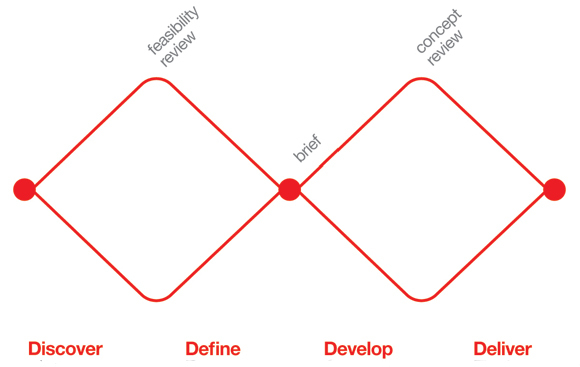 Divided into four distinct phases, Discover, Define, Develop, and Deliver, the diagram maps the divergent and convergent stages of the design process, showing the different modes of thinking that designers use. Final testing, approval and launch. Targets, evaluation and feedback loops. 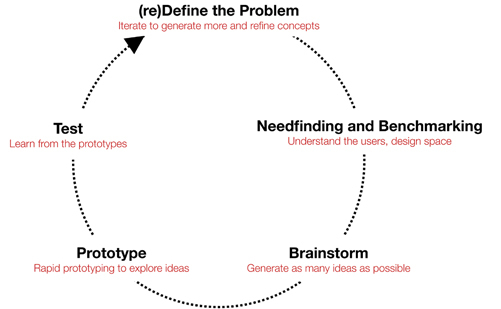 The d.school’s Design Process is about using a human-centered approach to create innovative solution(s) to a problem. The Design Process is taught to graduates, K-12 students and design thinking bootcamps led by the d.school. Empathy: The centerpiece to a human-centered design process. People should provide the inspiration and direction for ideas. Responding to human needs allows one to create designs that are both useful and meaningful to people. Define: Synthesize information and distill it down to big takeaways. Focus on a specific user or user group: their needs and the insights discovered. Create an actionable problem statement to unify the team, inspire others, and provides a launching pad for ideating solutions. Ideate: Step beyond obvious solutions. Ideate to create fluency (volume) and flexibility (variety) in innovation options. Be prolific, wild, and visual! Prototype: Explore options, test ideas, gain empathy, or communicate vision. If a picture is worth a thousand words, a prototype is worth a thousand pictures. Test: Learn what aspects of the solution are resonating with users and which are not. This feedback helps guide subsequent iterations. For methods on how to perform each step, go to the Design Thinking Bootcamp for more information. “Transformation Design” is a new design discipline that applies design skills to social and economic issues. It fosters interdisciplinary collaboration, proposes practical questions, and adopts a ‘user-centred approach.’ Fundamentally, it aims to show how design can help to create fundamental changes and social transformations. Looking from the point of view of the user: Understand the world of the user of products and services, and see things from their perspective. This can help to generate insights into how things could change and it can thus form the basis of collaborative action. Making things visible: Making sense of complex information through the use of visual frameworks, can create a common platform for discussing alternatives, and make sense of opportunities and resources. Prototyping: Trying solutions out and getting feedback in situ and with the users to test out possibilities for creating transformative changes. The Stanford Design Innovation Process is applied in ME310, a project-based design-engineering course at Stanford University. It is a course where students must design a complete system while being mindful of not only the primary function but also the usability, desirability, and societal implications. Throughout one academic year, student teams prototype and test many design concepts and in the end create a full proof-of-concept system that demonstrates their ideas. The design process in ME310 is cyclical. By going through the process multiple times, not only does it maximize student learning, it maximizes project insights for the student teams. “Fail early and fail often so you can succeed faster,” is one of the mantra for ME310. Observe and interview users to better understand their needs. Benchmark existing technologies and products to identify the design opportunities. Extensively brainstorm to discover the obvious, crazy, and novel ideas. Iteratively prototype to quickly test their ideas and get a better understanding of their designs. The end result is a refined design concept backed with key insights. 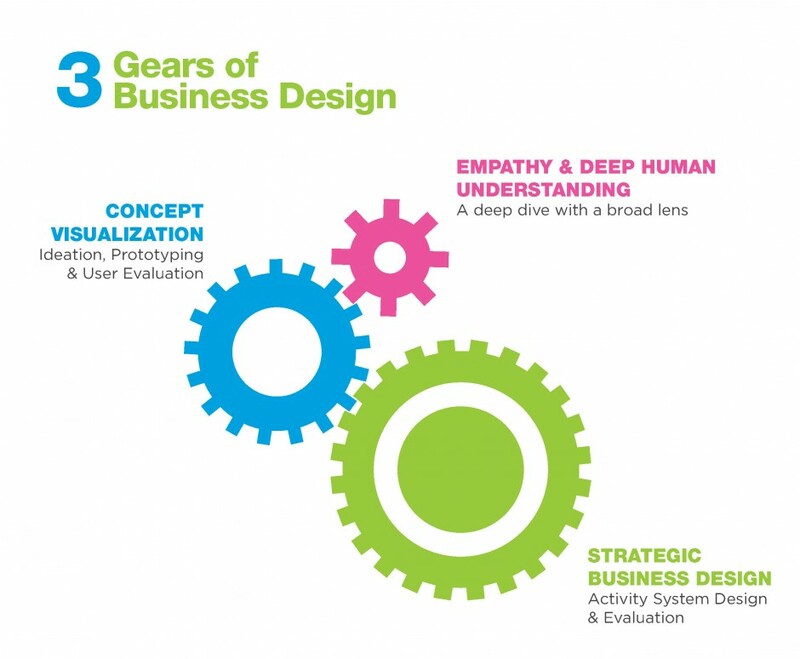 Rotman’s 3 Gears of Business Design are used to identify new opportunities, create bigger breakthroughs, and accelerate marketplace success. A deep and holistic understanding of the human factor helps to reframe the challenge, define criteria for innovation, and open up new opportunities to create user value. Making solutions tangible through rapid-prototyping and iteration is a creative, energizing, and risk-free way. It helps teams push the boundaries of innovation, capture complex solutions in concrete form, and ‘quick test’ ideas as the basis for new and unique value creation strategies. Mapping an organization’s interrelated strategies and tactics helps to visualize what will drive innovation success, prioritize which activities an organization must undertake to activate those strategies, and determine how the new model will impact enterprise value and competitiveness. 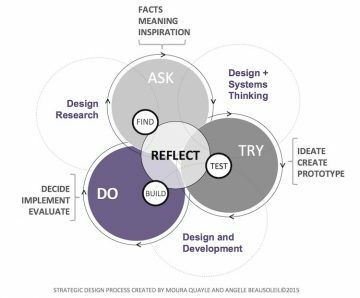 The Design Thinking Innovation Process is a design thinking process taught in the “Design Thinker” workshop – an award-winning workshop built in collaboration with Experience Point , the leader in business simulations, and innovation design firm, IDEO. It is an energizing workshop that challenges teams to flex their creativity to solve a realistic and complex design challenge. In so doing, they engage with the terms, techniques, and thought patterns of successful innovators. The participants navigate the design thinking process to originate innovative, workable solutions to a simulation problem. Create and implement new solutions with business impact, faster and more effectively. In summary, Design Thinker readies participants to effect meaningful change back on-the-job.